Thank you so much for this recipe Martha. What are the weights on the crocheted milk jug cover? That is a great idea and I have several pretty crocheted pieces that recently were shared with me. I could create something with a little fabric. It's a refreshing drink, but my drink of choice is plain unsweetened ice tea with lemon. Thanks for sharing the recipe. I'd like to sit on your porch and enjoy a glass of this ice cold treat. 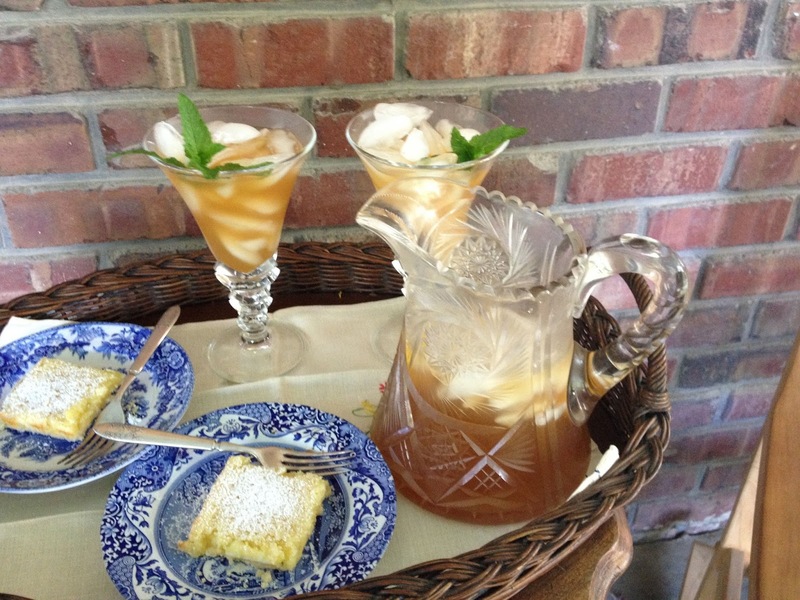 Martha, your iced tea looks just wonderful! I love the crocheted cloth over the pitcher; charming! Lemon bars sound lovely too. While my son was home we had lemon everything because he loves lemon. Too cold for iced tea here just yet and the cold damp weather we've had has made the mosquitoes the worst ever. Unfortunately we don't have a screened in porch so we have to sit inside and have our tea. Enjoy your tea on the porch and thank you for linking up with me for Tea Time. Happy 4th of July! Another delicious day at Linderhof! I bet the Plantation tea is wonderful! I put a bit of lemonade in my iced tea during the summer. Thanks for the recipe. I'm going to try it! Beautiful glass. Happy Monday! Your grandmother's pitcher is beautiful! You have made me want tea, I am going to go down now and make some. I like green tea sweetened with honey. Have a glorious week leading up to the 4th. 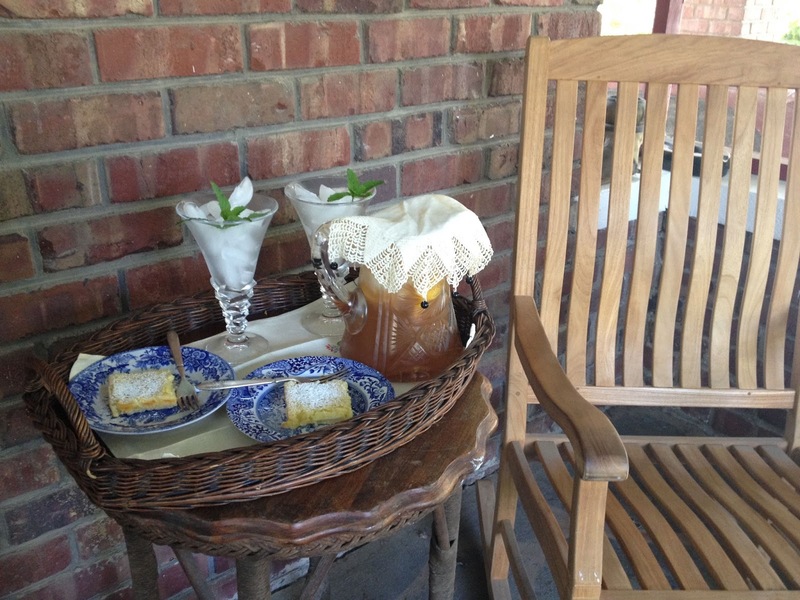 This a special place to to share tea on the porch! Your tray is so lovely and I'm sure your friend enjoyed the tea time! Your grandmother's pitcher is so beautiful The lemon bars are yummy looking. Have a great week! Have a beautiful day, Martha and thank you so much for your sweet words on my 100th post. Very nice, Martha! 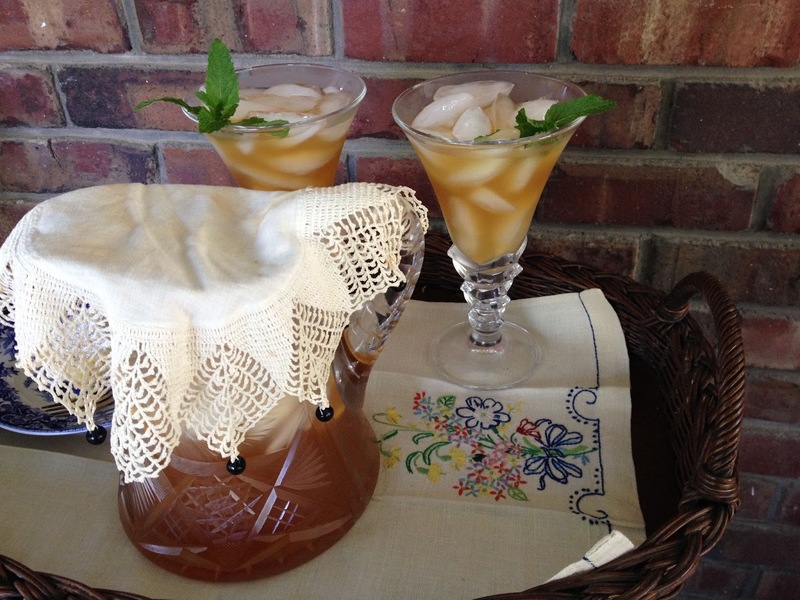 Happy National Iced Tea Month! Your iced tea looks so refreshing and I imagine that picture is definitely a 2 handed job! What a beautiful piece of glass. Lovely setting.